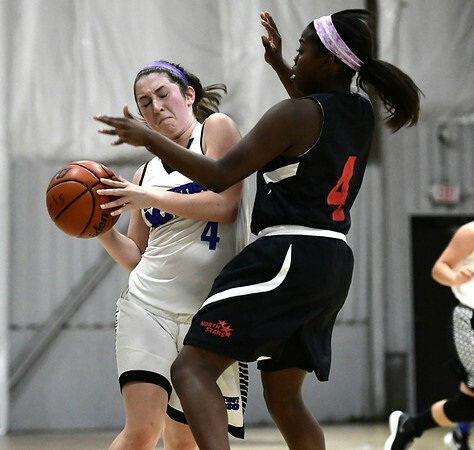 PLAINVILLE - In a pair of 20-minute halves it didn’t take long for those watching to know who was the better team in the Nutmeg Games 9th grade girls basketball tournament Wednesday night at the Basketball House in Plainville. The Connecticut Northstars AAU team ran up and down the court against the Bristol Warriors in an easy 59-13 win. Bristol didn’t score in the second half. All of Bristol’s 13 points came in the first half from two players, Skylar Blackinton and Olivia Hergott. Hergott led the team in scoring with seven points and Blackinton had six points off a pair of 3-pointers. Throughout the game Bristol was challenged on the fast break, gave up plenty of offensive rebounds and turned the ball over. The speed of the Northstars was a big difference in the two teams. Madison Romenello and Jasmine Ramirez combined for 28 of the Northstars 59 points in the game. It was the first game for either team in this year’s tournament and Bristol will next play this Friday at 8 p.m. at New Britain High School against the CT Heat (New Britain), another AAU team. Bristol will hope to bounce back but will need an improved showing to do so. Posted in The Bristol Press, General Sports on Wednesday, 1 August 2018 20:52. Updated: Wednesday, 1 August 2018 20:55.